Grand Staircase in Musei Vaticani. 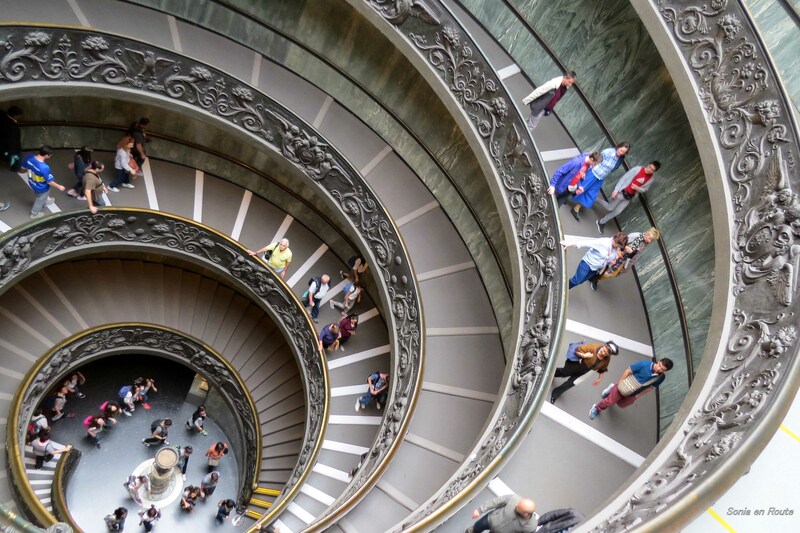 After visiting Musei Vaticani and seeing such incredible artifacts as the Sistine Chapel, tourists walk up and down the Grand Staircase and photograph it from every angle. For me it was a piece of architectural perfection locked in a curving snail shell of a staircase. Beautiful piece of functional art. My contribution to Weekly Photo Challenge – Curve. Good shot, Sonia. Perfect for this challenge. Very beautiful and I agree w Stefano, perfect for this week’s challenge. I have a fondness for circular stair cases. Your fit that desire. I’m glad you posted it. A very beautiful photo of a very beautiful staircase! I like that the people and stairs show perspective. I love this staircase. I’ve been to the Vatican Museum but I can’t remember seeing this, I’ve even checked my photos but no staircase. Unless I didn’t notice it with it being busy and the guide rushing us through. The staircase is located at the exit from the museum where you would return audioguides if you had them. There is a gift shop there – rather large – and the staircase is right by it. To get to the gift shop you would have to walk along the balustrade of the staircase. It goes down from that level.